Hyperion’s Romantic Cello Concerto series continues to bring new works into a repertoire currently dominated by Dvořák and Elgar. Alban Gerhardt performs the three concertos by Hans Pfitzner, a composer remembered most for his opera Palestrina. Pfitzner’s early Cello Concerto in A minor, Op posth., was scorned by his teachers (although liked by the composer himself) and the manuscript disappeared during his lifetime. It was first performed in public on 18 February 1977 and published the following year. His Cello Concerto in G major, Op 42, was written almost half a century later. Completed in 1935, this richly melodic single span was composed for the cellist Gaspar Cassadó (1897–1966), one of the finest cellists of his generation. This beautifully constructed concerto derives its material from the lyrical cello solo (heard over a quiet timpani roll) at the very start of the work. The orchestration is deft and often delicate, never submerging the solo instrument, but full of attractive surprises, not least the tumbling trumpet fanfares that introduce the first of the faster sections. The Cello Concerto in A minor, Op 52, is dedicated to Ludwig Hoelscher (1907–1996), a pupil of two giants of German cello-playing: Hugo Becker and Julius Klengel. It was completed in 1943 and published in 1944. Also included is a Duo for violin, cello and small orchestra. It’s an amusing quirk of history that Hans Pfitzner, one of the most ardently nationalistic German composers of his generation, was born in Moscow, on 5 May 1869. His father Robert was working there as a violinist in a theatre orchestra, though the family returned to Frankfurt am Main in 1872, and this is the city Pfitzner always considered to be his home town. Robert Pfitzner took up a position as leader (concert master) of the orchestra in the Stadttheater. Walter’s reference to ‘grim events’ is an uncomfortable but essential reminder of Pfitzner’s beliefs and his nationalist politics. In 1923 Pfitzner was in hospital in Munich for a gall bladder operation and one of his visitors was Adolf Hitler. It did nothing for Pfitzner’s short-term career aspirations—but ultimately helped to salvage something of his reputation—that he unwittingly enraged Hitler at this meeting and that Hitler didn’t care for his music either. Michael Kater (in The Twisted Muse) has written that afterwards Hitler told his companion, the poet Dieter Eckart, that he ‘did not want anything to do with this old rabbi—evidently mistaking the bearded Pfitzner for a Jew’. Poor Pfitzner: on the one hand he shared, or at least sympathized with, many of the beliefs of the Nazis (and the term ‘old rabbi’ was subsequently used by some of his detractors with the bitterest irony); on the other, Hitler himself—despite constant correction by Goebbels and others—remained convinced that Pfitzner was partly Jewish. The composer thought their brief encounter in 1923 had been quite successful, so he was devasted to have an invitation to conduct the music for the 1934 Nuremberg Rally withdrawn, on the grounds that Hitler was convinced that Pfitzner had Jewish blood. On numerous occasions Pfitzner invited Hitler to his concerts but was constantly rebuffed, or he was thwarted in attempts to fix face-to-face meetings. Having been branded a Jew, Pfitzner did his utmost to enthuse in public pronouncements about the Führer: ‘Today there is no one besides him with the strength of body, spirit and soul, this man whom we have known as our German Führer for the last ten years.’ But even this kind of flattery was to no avail in terms of helping Pfitzner’s ambition to become a highly regarded house composer to the Third Reich (unsurprisingly, Pfitzner’s simmering jealousy of Richard Strauss became obsessive; one Pfitzner biographer and supporter even described Strauss as the devil incarnate): not only did Hitler dislike Pfitzner’s music, but apparently he continued to harbour suspicions about Pfitzner’s origins to the end. In short, though Pfitzner’s politics were repellent in many ways, he never achieved the recognition he craved from Hitler himself. After the war, Pfitzner was shattered, his home in Munich had been destroyed, and for a time he was resident in a sanatorium in—of all places—Garmisch, where Strauss, his old nemesis, lived. Relatively few major composers of the nineteeth and twentieth centuries have written more than one cello concerto. Shostakovich wrote two, as did Saint-Saëns, Schnittke, Kabalevsky and Villa-Lobos; Dvorák sketched an early concerto for the instrument (later edited by various hands) as well as writing his famous B minor Concerto. 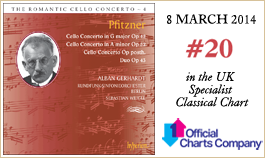 But Pfitzner is unusual in having written three cello concertos in the course of his career—one of them a student work (which, incidentally, predates Dvorák’s B minor Concerto), while the other two are from the end of his career. The early Cello Concerto in A minor, Op posth., was written in 1888, the result of Pfitzner’s friendship with the cellist Heinrich Kiefer (1867–1922)—a fellow student at the Frankfurt Conservatory. In order for the work to be performed, it needed approval from the Director, Bernhard Scholz, but he was unimpressed, noting with outrage that Pfitzner had made what he considered an elemetary error in using ‘three trombones in a cello concerto!’. (In passing, it should be noted that in his 1894–5 concerto, Dvorák used not only three trombones but also a tuba.) An attempt to obtain support for the work from Max Bruch also failed—a smarting Pfitzner later recalled ‘an awfully impolite letter’ from the older composer. 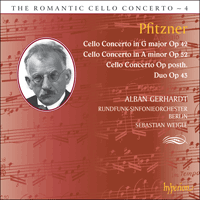 Pfitzner recycled a few musical ideas from the concerto in his first opera, Der arme Heinrich, but the manuscript of his early Cello Concerto subsequently disappeared, much to the composer’s distress, since he believed that it contained worthwhile music and always regarded it with affectionate nostalgia—as he showed by returning to it when writing the Op 52 Cello Concerto in later life. The A minor Concerto is in two sections. The first begins Andante molto moderato with a gently swaying theme that emerges from the orchestral cellos and a solo bassoon, soon followed by the first entry of the soloist on a long, very quiet held E which develops into a lyrical and increasingly dramatic soliloquy that leads to the main Allegro. There’s a youthful energy about this music—Pfitzner at his most unselfconscious, relishing the challenge of writing for a brilliant virtuoso soloist who brings the movement to a close with a dazzling scale in octaves. The second section is of a less predictable formal design. It opens with the expressive core of the concerto, a long-breathed Adagio molto tranquillo which is dominated by a song-like melody introduced by the soloist and subsequently developed in a rapturous dialogue with the orchestra, especially the woodwind. A brief, exciting Allegro recalling the falling theme from the first movement is followed by a reflective cadenza for the soloist, and a return to the mood of the work’s opening, reaching a serene conclusion in A major. This early work was first performed in public on 18 February 1977, by the cellist Esther Nyffenegger with the orchestra of the Würzburg Musikhochschule conducted by Hermann Dechant, and it was published the following year. Pfitzner’s Cello Concerto in G major, Op 42, was written almost half a century later. Completed in 1935, this richly melodic single span was composed for the cellist Gaspar Cassadó (1897–1966). Pfitzner may not necessarily be the first name to come to mind for a composer whose music is concise and organic, but both these aspects of the composer’s craft are apparent in this beautifully constructed concerto. The thematic material is all derived from the lyrical cello solo (heard over a quiet timpani roll) at the very start of the work. Contrasting with this close integration of musical ideas, Pfitzner explores his material through a cleverly controlled variety of pace. The orchestration is deft and often delicate, never submerging the solo instrument, but full of attractive surprises, not least the tumbling trumpet fanfares that introduce the first of the faster sections. Though the concerto was written for Cassadó, one of the finest cellists of his generation, there is plenty of musical argument at the centre of the work where the soloist takes a subsidiary role, allowing extensive, sometimes witty dialogue to develop between the strings and woodwind. The soloist crowns this with a highly expressive return of the main theme leading to a lovely coda—a restrained, harp-drenched transfiguration of the opening theme, with the soloist bringing the music to a quietly rapturous close. In this Cello Concerto Op 52 there is woven a melody which was the main theme of a Cello Concerto written during my time at the Conservatory. This youthful work has never been performed … but the main theme seems to me worthy to be rescued from oblivion. I have used it in some parts of this work from my old age as a salute to my youth. The Op 52 Cello Concerto uses a modestly proportioned classical orchestra (double wind, four horns, two trumpets, timpani, percussion, harp and strings) and is cast in four movements. The first, marked Ruhig (‘Peaceful’), is in gently flowing triple time, while the second (Nicht zu schnell—‘Not too fast’) is a spiky duple-time scherzo. A moto perpetuo launched by the soloist soon gives way to a a delightful rollicking tune (beginning as a descending major scale) that sounds as if it could have escaped from an operetta. The third movement, Feierlich (‘Solemn’), is short but most eloquent, and the finale is an Allegretto in the style of a jig, dominated by a rather jaunty theme. In 1937, Pfitzner composed his Duo, Op 43, for violin, cello and small orchestra, dedicating it to the violinist Max Strub and cellist Ludwig Hoelscher. It is a single movement in three distinct sections: the first is a stern and serious Allegro moderato; this is followed by a slow section, much of it in recitative-like dialogue between the two soloists; and finally the music turns to A major for the closing section, moderately fast, in triple time. This is a work with moments of great charm, even if it doesn’t quite match the memorable character of the cello concertos. Par un amusant caprice de l’histoire, Hans Pfitzner, l’un des compositeurs allemands les plus ardemment nationalistes de sa génération, naquit le 5 mai 1869 à Moscou, où son père Robert était violoniste dans un orchestre de théâtre. En 1872, cependant, la famille rentra à Francfort-sur-le-Main, que Hans considéra à jamais comme sa ville natale. Robert Pfitzner devint premier violon de l’orchestre du Stadttheater. L’allusion de Walter aux «sinistres événements» renvoie de manière désagréable mais fondamentale aux opinions et aux idées nationalistes de Pfitzner. En 1923, alors qu’il était hospitalisé à Munich pour une opération de la vésicule biliaire, Pfitzner reçut la visite d’Adolf Hitler, qu’il fit involontairement enrager et qui ne s’intéressa en rien à sa musique—ce qui n’aida pas ses aspirations professionnelles à court terme mais contribua à sauver un peu sa réputation. Selon Michael Kater dans The Twisted Muse, Hitler, à l’issue de cette rencontre, dit à son compagnon le poète Dieter Eckart, qu’il «ne voulait rien avoir à faire avec ce vieux rabbin—prenant à l’évidence le barbu Pfitzner pour un Juif». Pauvre Pfitzner: d’un côté, il partageait nombre des opinions des nazis, ou du moins il en était sympathisant (et l’expression «vieux rabbin» sera utilisée, avec la plus amère ironie, par certains de ses détracteurs); de l’autre, Hitler lui-même—malgré de constantes rectifications de gens comme Goebbels—demeurait convaincu qu’il était en partie juif. Pfitzner pensait que sa brève rencontre avec Hitler, en 1923, avait été un franc succès, aussi fut-il dévasté quand on lui retira son invitation à venir diriger la musique du grand meeting de Nuremberg en 1934, au prétexte que Hitler était persuadé qu’il avait du sang juif. À maintes reprises, Pfitzner invita Hitler à ses concerts, mais il essuya rebuffade sur rebuffade et toutes ses tentatives pour obtenir un tête-à-tête furent contrecarrées. Étiqueté juif, il fit tout son possible pour s’enflammer publiquement pour le Führer: «Aujourd’hui, il n’est personne qui ait la force de corps, d’esprit et d’âme de celui en qui nous avons, depuis dix ans, trouvé le Führer allemand.» Mais même ce genre de flagornerie ne servit en rien son ambition de devenir un compositeur très estimé du IIIe Reich (bien sûr, sa jalousie latente à l’égard de Richard Strauss vira à l’obsession; un de ses biographes et défenseurs alla jusqu’à qualifier Strauss de diable incarné): non seulement Hitler détesta sa musique mais, apparemment, il demeura soupçonneux quant à ses origines. Bref, malgré des opinions à bien des égards repoussantes, Pfitzner n’obtint jamais de Hitler la reconnaissance tant sollicitée. La guerre le laissa brisé, sa maison munichoise avait été détruite et, pendant un moment, il résida dans un sanatorium à … Garmisch, où vivait son vieux rival Strauss. Assez peu de grands compositeurs des XIXe et XXe siècles ont écrit plus d’un concerto pour violoncelle. Chostakovitch en écrivit deux, tout comme Saint-Saëns, Schnittke, Kabalevski et Villa-Lobos; Dvorák en esquissa un à ses débuts (dont l’édition sera préparée par plusieurs mains), en plus de son célèbre Concerto en si mineur. Mais Pfitzner, lui, en composa trois—un pendant ses études (pour la petite histoire, il est antérieur à celui en si mineur de Dvorák) et deux à la fin de sa carrière. Pfitzner rédigea son précoce Concerto pour violoncelle en la mineur, op. posth, en 1888, par amitié pour le violoncelliste Heinrich Kiefer (1867–1922), son condisciple au Conservatoire de Francfort. Pour pouvoir être jouée, l’œuvre devait être approuvée par le directeur, Bernhard Scholz, mais celui-ci, tout sauf impressionné, souligna, outré, que Pfitzner avait commis une erreur, à ses yeux élémentaire, en utilisant «trois trombones dans un concerto pour violoncelle!» (Soit dit en passant, le concerto écrit par Dvorák en 1894/5 requiert trois trombones et un tuba.) Pfitzner chercha également en vain le soutien de son aîné Max Bruch—piqué au vif, il se rappellera avoir reçu de lui «une lettre affreusement impolie». Dans son premier opéra, Der arme Heinrich, il recycla certaines idées musicales de ce concerto de jeunesse, dont le manuscrit disparut bientôt. À sa grande angoisse, car il renfermait, à ses yeux, quelque musique digne d’intérêt. Il le considéra d’ailleurs toujours avec une tendre nostalgie, qu’il montra en y revenant au moment d’écrire, vers la fin de sa vie, son Concerto pour violoncelle, op.52. Le Concerto en la mineur compte deux sections. La première démarre Andante molto moderato avec un thème doucement chaloupé qui émerge aux violoncelles de l’orchestre et un basson solo, bientôt suivi par la première entrée du soliste sur un long et très paisible mi tenu qui se mue en un soliloque lyrique, toujours plus tragique, menant à l’Allegro principal. Cette musique à l’énergie juvénile nous montre un Pfitzner naturel au possible, goûtant le défi consistant à écrire pour un brillant virtuose, qui termine le mouvement sur une étincelante gamme en octaves. La seconde section a un schéma formel moins prévisible. Elle s’ouvre sur le cœur expressif du concerto, un Adagio molto tranquillo au long souffle, sous l’empire d’une mélodie chantante introduite par le soliste puis développée en un dialogue extasié avec l’orchestre, en particulier avec les vents. Passé un bref Allegro palpitant, qui rappelle le thème descendant du premier mouvement, une cadenza méditative pour le soliste et un retour au climat de l’ouverture mènent à une conclusion sereine en la majeur. Cette œuvre de jeunesse fut créée en public le 18 février 1977 par la violoncelliste Esther Nyffenegger et l’orchestre de la Würzburg Musikhochschule placés sous la baguette de Hermann Dechant; elle fut publiée l’année suivante. Le Concerto pour violoncelle en sol majeur, op.42, fut rédigé presque cinquante ans plus tard. Achevé en 1935, ce monobloc richement mélodique fut composé pour le violoncelliste Gaspar Cassadó (1897–1966). Qui dit Pfitzner ne dit pas forcément musique concise et organique mais là, dans ce concerto merveilleusement construit, ces deux aspects sont évidents. Le matériau thématique dérive tout entier du lyrique solo de violoncelle (par-dessus un tranquille roulement de timbales), en tout début d’œuvre. Pour contraster avec cette intégration resserrée des idées musicales, Pfitzner explore son matériau via une diversité de tempos habilement maîtrisée. L’orchestration, adroite et souvent subtile, ne submerge jamais l’instrument solo mais est truffée de surprises attrayantes, à commencer par les cascadantes fanfares de trompettes introduisant la première des sections plus rapides. Ce concerto a beau avoir été écrit pour Cassadó, l’un des meilleurs violoncellistes de sa génération, quantité d’arguments musicaux, au centre de l’œuvre, octroient au soliste un rôle secondaire, permettant l’essor d’un vaste, et parfois spirituel, dialogue entre les bois et les cordes. Le soliste vient couronner le tout par un fort expressif retour au thème principal menant à une ravissante coda—une transfiguration sobre, aspergée de harpe, du thème inaugural; le soliste clôt l’œuvre dans une extase paisible. Dans ce Concerto pour violoncelle op.52 se trouve ce qui était le thème principal d’un Concerto pour violoncelle écrit pendant mes années de Conservatoire. Cette œuvre de jeunesse n’a jamais été jouée … mais son thème principal me paraît digne d’être sauvé de l’oubli. J’en ai donc utilisé quelques morceaux dans mon œuvre de vieillesse, en hommage à ma jeunesse. Le Concerto pour violoncelle op.52 utilise un orchestre classique de dimensions modestes (vents par deux, quatre cors, deux trompettes, timbales, percussion, harpe et cordes) et est coulé en quatre mouvements. Le premier, marqué Ruhig («Paisible») adopte un rythme ternaire doucement fluide, tandis que le suivant (Nicht zu schnell—«Pas trop vite») est un ombrageux scherzo binaire. Un moto perpetuo lancé par le soliste cède bientôt la place à un charmant air joyeux (partant sur une gamme majeure descendante), comme échappé d’une opérette. Le troisième mouvement, Feierlich («Solennel») est court mais des plus éloquents, et le finale, un Allegretto en style de gigue, est dominé par un thème assez jovial. En 1937, Pfitzner composa son Duo, op.43, pour violon, violoncelle et petit orchestre dédié au violoniste Max Strub et au violoncelliste Ludwig Hoelscher. Il s’agit d’un mouvement unique en trois sections distinctes: un austère et grave Allegro moderato, suivi d’une section lente où les deux solistes ne font presque que dialoguer comme dans un récitatif; enfin, la musique passe à la majeur pour la section conclusive, modérément rapide, en mètre ternaire. Cette œuvre présente des moments fort charmants, sans pour autant être aussi mémorable que les concertos pour violoncelle. Es ist eine Ironie der Geschichte, dass der leidenschaftlich nationalistische Komponist Hans Pfitzner in Moskau geboren wurde (am 5. Mai 1869), da sein Vater Robert dort als Orchestergeiger engagiert war. 1872 zog die Familie jedoch bereits nach Frankfurt am Main um, wo Robert Pfitzner Konzertmeister am Stadttheater wurde; Hans Pfitzner betrachtete Frankfurt stets als seine Heimatstadt. Walters Anspielung an die „düsteren Zeitereignisse“ ist eine unbequeme, aber notwendige Erinnerung an Pfitzners Überzeugungen und seine nationalistische Gesinnung. 1923 war Pfitzner aufgrund einer Gallenblasen-Operation im Krankenhaus in München, wo zu seinen Besuchern auch Adolf Hitler gehörte. Auf kurze Sicht war es für Pfitzners Karriere wenig förderlich—wenn sein Ruf damit auch später jedenfalls teilweise gerettet werden konnte—, dass er Hitler bei dieser Zusammenkunft unabsichtlich in Wut versetzte und dass sich Hitler auch nicht für seine Musik interessierte. Michael Kater zufolge (in The Twisted Muse; deutscher Titel: Die mißbrauchte Muse. Musiker im Dritten Reich) erklärte Hitler seinem Begleiter, dem Dichter Dieter Eckart, danach, dass er mit dem alten Rabbi nichts zu tun haben wolle—offensichtlich hatte er den bärtigen Pfitzner irrtümlich für einen Juden gehalten. Armer Pfitzner: einerseits teilte er viele Ansichten der Nazis, oder sympathisierte zumindest mit ihnen (und der Ausdruck „alter Rabbi“ wurde später von mehreren seiner Kritiker mit der bittersten Ironie verwendet), andererseits jedoch blieb Hitler (trotz fortwährender Korrektur von Goebbels und anderen) davon überzeugt, dass Pfitzner jüdischer Herkunft sei. Der Komponist hatte den Eindruck gehabt, dass ihr kurzes Treffen 1923 recht erfolgreich verlaufen sei und war dementsprechend bestürzt, dass die Einladung, die Musik zum Reichsparteitag 1934 zu dirigieren, wieder zurückgezogen wurde, weil Hitler davon überzeugt war, dass Pfitzner jüdisches Blut habe. Pfitzner lud Hitler zu mehreren seiner Konzerte ein, wurde jedoch stets abgewiesen und Anläufe, persönliche Treffen zu arrangieren, wurden vereitelt. Nachdem er als Jude gebrandmarkt worden war, tat Pfitzner sein Äußerstes, den Führer in öffentlichen Ansprachen zu loben: „Es gibt heute keinen neben ihm, der die Kraft des Armes, des Geistes und der Seele mitbrächte als der, in dem wir seit über zehn Jahren den deutschen Führer gefunden haben.“ Doch selbst diese Art von Schmeichelei war vergebens, was Pfitzners Ehrgeiz anbelangte, ein hochangesehener Hauskomponist des Dritten Reiches zu werden (es ist wohl kaum überraschend, dass Pfitzners schwelender Neid auf Richard Strauss zur Obsession wurde; ein Pfitzner-Biograph und Förderer des Komponisten bezeichnete Strauss sogar als den Teufel in Menschengestalt): Hitler hatte nicht nur eine Abneigung gegen Pfitzners Musik, sondern argwöhnte offenbar bis zum Schluss, dass er jüdischer Herkunft sei. Kurz gesagt, obwohl Pfitzners Politik in vielerlei Hinsicht abstoßend war, erlangte er nie die Anerkennung Hitlers, die er sich so sehr erhoffte. Von dem Krieg war Pfitzner sehr betroffen, sein Wohnhaus in München wurde zerstört und aufgrund gesundheitlicher Beschwerden hielt er sich eine Zeitlang in einem Sanatorium auf, das sich ausgerechnet in Garmisch befand, wo Strauss, sein alter Erzfeind, lebte. Relativ wenige große Komponisten des 19. und des 20. Jahrhunderts haben mehr als ein Cellokonzert geschrieben. Schostakowitsch komponierte zwei, ebenso Saint-Saëns, Schnittke, Kabalewsky und Villa-Lobos; Dvorák skizzierte ein frühes Konzert für das Instrument (das später von verschiedenen Seiten ediert wurde) und schrieb sein berühmtes Konzert h-Moll. Pfitzner ist jedoch insofern ungewöhnlich, als dass er im Laufe seiner Karriere drei Cellokonzerte schrieb—eines stammt aus seiner Studentenzeit (und ist älter als Dvoráks h-Moll-Konzert), während die anderen beiden gegen Ende seiner Karriere entstanden. Das frühe Cellokonzert in a-Moll, op. posth., entstand 1888 aus Pfitzners Freundschaft mit dem Cellisten Heinrich Kiefer (1867–1922) heraus, der ein Mitschüler Pfitzners am Frankfurter Konservatorium war. Um eine Aufführung des Werks zu ermöglichen, musste es vom Direktor, Bernhard Scholz, zugelassen werden, der ihm jedoch nicht wohlgesonnen war, da er einen für seine Begriffe groben Fehler daran festgestellt hatte—Pfitzner hatte drei Posaunen darin verwendet. (Nebenbei sei darauf hingewiesen, dass Dvorák in seinem Konzert von 1894/5 nicht nur drei Posaunen, sondern auch eine Tuba einsetzte.) Ein weiterer Versuch, das Werk von Max Bruch anerkennen zu lassen, schlug ebenfalls fehl—ein verletzter Pfitzner erinnerte sich später an einen „äußerst unhöflichen Brief“ von dem älteren Komponisten. Pfitzner verwendete mehrere musikalische Ideen aus dem Konzert in seiner ersten Oper, Der arme Heinrich, wieder, doch verschwand das Manuskript seines frühen Cellokonzert später, sehr zur Betrübnis des Komponisten, der der Ansicht war, dass es wertvolle Musik enthielt und es stets mit zärtlicher Nostalgie betrachtete, was damit verdeutlicht wird, dass er darauf zurückgriff, als er später sein Cellokonzert op. 52 komponierte. Das a-Moll-Konzert hat zwei Teile. Der erste beginnt Andante molto moderato mit einem sanft wiegenden Thema, das aus den Orchester-Celli und einem Solo-Fagott hervortritt und auf das bald darauf der erste Einsatz des Solisten auf einem langen, sehr leisen und ausgehaltenen E folgt, das sich in einen lyrischen und zunehmend dramatischen Monolog entwickelt und in den Hauptabschnitt Allegro hinüberleitet. Die Musik zeichnet sich durch eine jugendliche Energie aus—Pfitzner ist hier besonders unbefangen und genießt die Herausforderung, für einen brillanten, virtuosen Solisten zu schreiben, der den Satz mit einer glänzenden Tonleiter in Oktaven abschließt. Der zweite Satz hat eine weniger vorhersehbare formale Anlage. Er beginnt mit dem expressiven Kern des Konzerts, ein weit ausholendes Adagio molto tranquillo, das von einer liedhaften Melodie bestimmt wird, die vom Solisten eingeführt und dann in einem verzückten Dialog mit dem Orchester, insbesondere in den Holzbläsern weiterentwickelt wird. Auf ein kurzes, spannendes Allegro, in dem das fallende Thema des ersten Satzes nochmals auftritt, folgt eine nachdenkliche Kadenz für den Solisten sowie eine Rückkehr der Stimmung vom Beginn des Werks, in der ein heiteres Ende in A-Dur erreicht wird. Dieses Frühwerk wurde am 18. Februar 1977 von der Cellistin Esther Nyffenegger zusammen mit dem Orchester der Würzburger Musikhochschule unter der Leitung von Hermann Dechant erstmals aufgeführt und im darauffolgenden Jahr herausgegeben. Sein Cellokonzert in G-Dur, op. 42, komponierte Pfitzner fast ein halbes Jahrhundert später. Dieses melodisch reichhaltige und kontinuierlich verlaufende Werk entstand für den Cellisten Gaspar Cassadó (1897–1966) und wurde 1935 fertiggestellt. Pfitzner mag für präzise und organische Kompositionstechniken nicht gerade berühmt sein, doch treten eben diese beiden Aspekte seiner Kunst in diesem wunderschön gearbeiteten Konzert in den Vordergrund. Das thematische Material stammt gänzlich aus dem lyrischen Cello-Solo, das ganz zu Anfang über einem leisen Paukenwirbel erklingt. Im Gegensatz zu dieser engen Verknüpfung von musikalischen Ideen erschließt Pfitzner sein Material mithilfe einer geschickt kontrollierten Vielfalt von Gangarten. Die Orchestrierung ist gewandt und oft feingliedrig gestaltet—das Soloinstrument wird nie zugedeckt, doch ist der Orchestersatz voller reizvoller Überraschungen, so etwa die herunterpurzelnden Trompetenfanfaren, die den ersten der schnelleren Abschnitte einleiten. Obwohl das Konzert für Cassadó entstand, der einer der besten Cellisten seiner Generation war, finden sich im Kern des Werks verschiedene Abschnitte, wo der Solist eine untergeordnete Rolle einnimmt und sich ausgedehnte und zuweilen geistreiche Dialoge zwischen Streichern und Holzbläsern entwickeln. Der Solist setzt diesem Gefüge die Krone auf, indem er in äußerst ausdrucksvoller Weise das Hauptthema wieder erklingen lässt, was dann in eine sehr schöne Coda übergeht: eine zurückgehaltene, harfendurchtränkte Verklärung des Anfangsthemas, in der der Solist die Musik zu einem leise verzückten Abschluss bringt. In dieses Cellokonzert op. 52 ist ein Thema eingewebt, welches das Hauptthema eines in meiner Konservatoriumszeit geschriebenen Cellokonzertes bildete. Diese Jugendarbeit ist nie aufgeführt worden … aber das Hauptthema scheint mir doch wert, der Vergessenheit entrissen zu werden. So habe ich es an einigen Stellen meines Alterswerkes erklingen lassen als einen Gruß an meine Jugend. Das Cellokonzert, op. 52, hat einen bescheiden angelegten klassischen Orchesterapparat (doppelte Holzbläser, vier Hörner, zwei Trompeten, Pauke, Schlagwerk, Harfe und Streicher) und ist viersätzig angelegt. Der erste Satz ist mit Ruhig bezeichnet und steht in einem sanft fließenden Dreiertakt, während der zweite (Nicht zu schnell) ein spitzes Scherzo im Zweierrhythmus ist. Ein Moto Perpetuo, das vom Solisten begonnen wird, geht bald in eine reizvolle, ausgelassene Melodie über, die als abwärts gerichtete Durtonleiter beginnt und so klingt, als stamme sie aus einer Operette. Der dritte Satz, Feierlich, ist kurz aber äußerst gewandt und das Finale, ein Allegretto, ist im Stil einer Gigue gehalten und wird von einem recht munteren Thema dominiert. 1937 komponierte Pfitzner sein Duo, op. 43, für Violine, Violoncello und kleines Orchester und widmete es dem Geiger Max Strub und dem Cellisten Ludwig Hoelscher. Dabei handelt es sich um einen einzelnen Satz in drei deutlich voneinander abgegrenzten Abschnitten; der erste ist ein strenges und ernstes Allegro moderato, darauf folgt ein langsamer Abschnitt, der hauptsächlich aus einem rezitativartigen Dialog zwischen den beiden Solisten besteht. Schließlich bewegt sich die Musik im Schlussteil in mäßig schnellem Tempo und im Dreiertakt nach A-Dur. Dieses Werk besitzt durchaus bezaubernde Momente, selbst wenn es nicht ganz an den unvergesslichen Charakter der Cellokonzerte heranreicht.